On Friday, I was first in line at our local Target to get an iPAD 2. I intentionally didn’t get the first generation because I like to let things like this filter for awhile. Let people with far more disposable income do the product testing – that’s my policy. So what do I think? 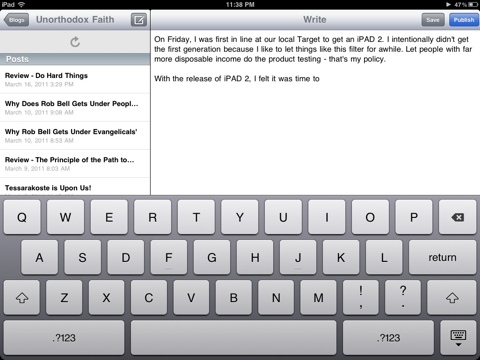 Below is a screenshot of me writing this blog entry. With the release of iPAD 2, I felt it was time to jump into the fray. I admit it, Steve Jobs sold me on it with his keynote address. After watching the keynote, I made a decision. I sold my iPod Touch and a guitar to get the money to buy an iPad. I was sold, but I wasn’t going to just add the iPad to my already muddled collection of gadgets. Had to unload some first and then I freed the whole. So, what can I say? The iPad is everything it is supposed to be. It does what it does – and it doesn’t do what it can’t. 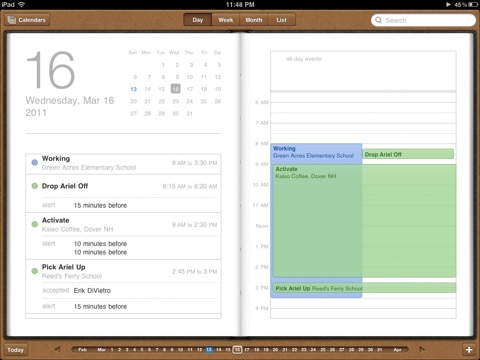 I particularly like the calendar format, which is much more like a planner than the iPod or Mac versions. I did have to upgrade a few of my iPhone apps, but most of them were already iPad ready which was nice. I did buy two iPad specific apps. 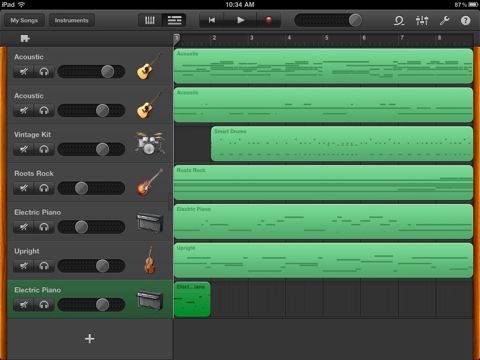 The first is GarageBand, possibly the coolest iOS app ever coded. The smart instruments are particularly cool and the interface is largely intuitive. Within a few minutes, I was writing some pretty decent sounding stuff. And at $5, who can argue with the price? The other app I got was more specific to the work I do. I bought Index Cards, which syncs with my Mac writing program – Scrivener. This is good because I am in the middle of writing a book based on our experiences merging congregations to form Bedford Road Baptist Church. Ironically, the bugiest app that I have had to deal with is the WordPress app, which I am using to write this entry. It has constantly shut down on me as well as not uploading media properly. Previous postWhy Does Rob Bell Gets Under People’s Skin?